It is helpful to know whether your volume is correct before exporting your recording to an MP3 file. There is a Nyquist plug-in for Audacity called ReplayGain which allows you to do this. It also provides a facility for Equal Loudness Normalization (ie for amplifying to the required level). First, make sure you are running the latest version of Audacity, 2.3.0, obtainable from here. When you install Audacity on Mojave you may get a warning message saying that the program will not work on future versions of MacOS. That can be ignored. 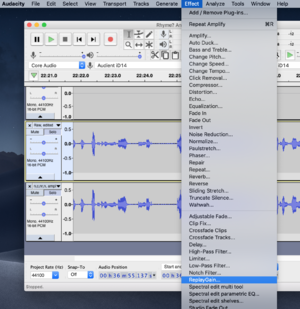 Hopefully by the time Apple goes beyond Mojave, Audacity will have been updated as well. Ignore older instructions telling you where to save the ReplayGain.ny file: it actually needs to be stored within the Audacity.app package itself. You'll probably find that in ~/Applications, called Audacity, and though it looks like a single file it is in fact a package that can be opened. You should find ReplayGain as one of the items under the Effect menu (towards the bottom, under the horizontal divider). If you can't see the entry, make sure that ReplayGain is enabled via the Effect | Add/Remove Plug-ins menu option. First, make sure you are running the latest version of Audacity, 2.3.0, obtainable from here. Installation on Windows 10 is also discussed here. Go to the folder in which the Audacity plugins are installed (it's probably in somewhere like /home/USERNAME/.audacity-data/Plug-Ins). Note that .audacity-data is a hidden folder, so make sure that View Hidden Files is checked in your file manager. If there is no such folder, create it. The author explains use of the plugin in the Audacity forum here. There is an explanatory video here. N.B. Please be aware that this plug-in does not warn you if amplification will cause clipping when you Normalize. Check by View | Show Clipping and then View | Fit in Window. If red vertical lines are showing, this means that the audio has reached a level of volume where your voice may be distorted. If this happens, click Undo to undo the Normalization, and use the Effect | Amplify feature without the Allow Clipping box checked. Note that old versions of ReplayGain didn't have the ability to do amplification. In old versions of Audacity the plugin was accessed via the Analyze rather than the Effect menu. That's only likely to be relevant if you are running outdated software; please consider upgrading. This page was last edited on 24 March 2019, at 13:58.